My original goal was simply to share time together at the Gate City Relay and Marathon during which friends running the relay would also help guide me for the Marathon in my home town. 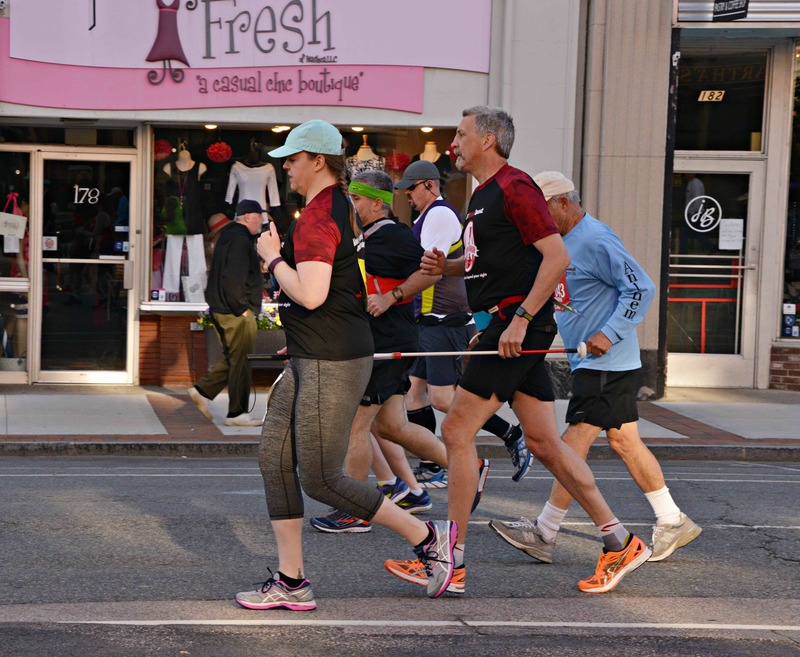 Things began to get interesting when the Gate City Striders, who host the event, chose to add a VI (Visually Impaired) Division on their journey towards ever more inclusion in this great community experience. 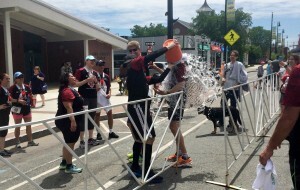 It became more complicated still when challenges during my Boston Marathon allowed me to finish but not get my Boston qualifier for next year’s Marathon (which I truly hope to run every year if possible). This is only more complicated if we decided to elevate the original goal and take on those additional possibilities. While I love striving for goals, I love far more the friends and opportunities to savor experiences with them. I shared all of this with them and was only surprised by the fervor of the response from each member who wanted to make this a team goal and strive together for it! This meant people had to challenge themselves and choose some sacrifices, which they did, and the result… all the magic that friends coming together provides, including an incredible catharsis of emotions throughout the day. I loved support from so many friends all over the course and from our extended relay teams and my incredible wife, who made much of this happen in particularly special fashion once again. This blog just gives a little extra sharing of the experience with my guides. Erin and Randy start off the Gate City Relay and Marathon. Erin was up first in the chilly 7:00 sleepiness. 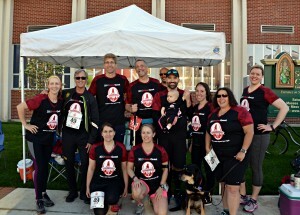 There was enough race excitement to wake us and set us on the course for success. 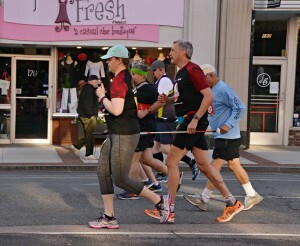 She had never guided me in an actual race, yet had to manage the crowds at their thickets and did so without complaint. 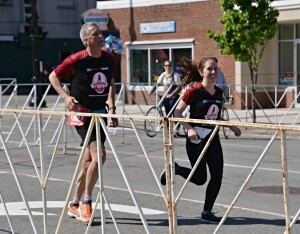 I already knew she was great at staying within her running needs and my role was to not overtax her in need to talk beyond the guide needs, nor to ask more of her than the pace she had for me to warm up the race. My real goal was to get warmed up and ensure she knew how much I appreciated the work and pushing she’d done to be ready, but for me that pushing was never more clear than the final stretch when I could hear how hard she was working and yet she wasn’t backing off her pace. I could tell she had nothing to give and no words left to speak but I could also tell she nailed it, which was confirmed when I later saw her first Facebook post proudly sharing what we both knew she’d achieved. Jenn and Randy on the next leg of the race. Jenn was the third loop and had a repeat of Erin’s loop so I had some knowledge for her. 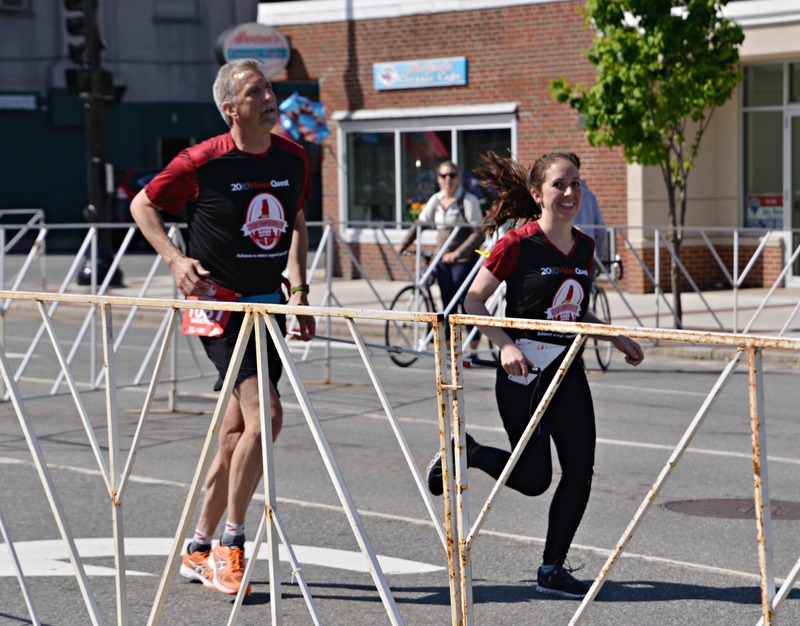 This was her first return to running after the birth of her and Greg’s incredibly charming daughter Stella who joined us (team shirt!) as support staff for the day. Jenn had not only been sick but had been hospitalized the prior week but was mostly recovered. That showed as she crushed her expected pace and did her most solid guide work in our limited time. I can’t ever forget that her first experience was being handed the guide stick mid-race two years back, mind you, but this time it was with a plan and I could not be more proud and appreciative of how that plan, like our path to friendship, turned into something solid and successful! Her own words on the day’s experience. Yeah Rob… he got me! Robbie guide Randy to the finish! 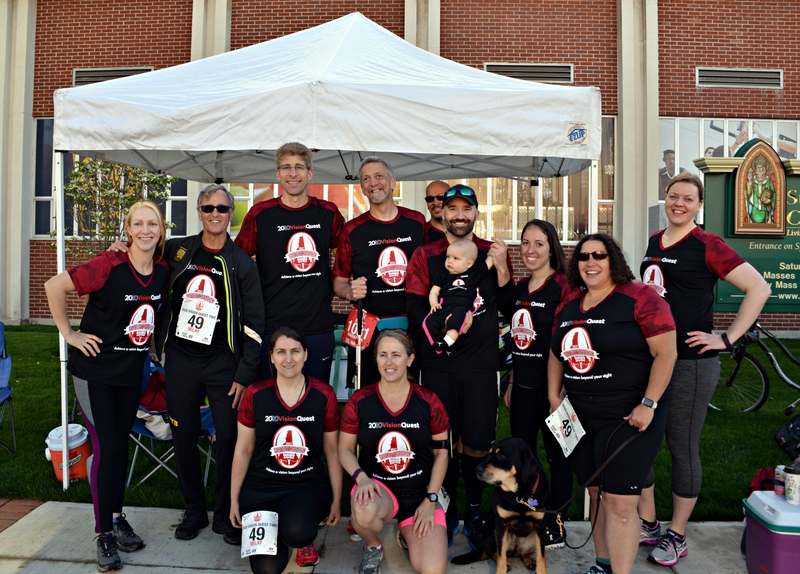 We crossed the finish line together, we celebrated together, we supported our other relay team’s finish and our final Marathoner together (great work, Sarah Toney) before the final dinner. We were tired, proud, and full of smiles. It wasn’t reaching our goals successfully, though that certainly helped; it wasn’t even the choice to reach for those goals; it was the choice to be the people who support each other, believe in each other, encourage each other, and in the process make life something brighter and better. 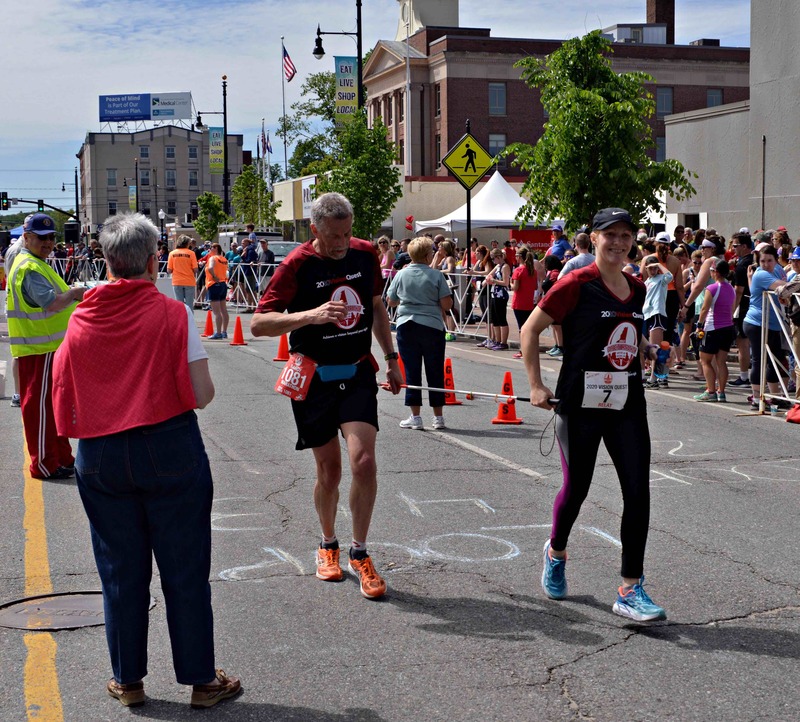 This was one shining day on the streets of Nashua’s showcase running event but it’s a way of life which will help us appreciate each other and this world so much more! « Hollis Upper Elementary Believes and Achieves!